The 10 Best Bars in Missouri! Whether you’ve lived in Missouri for generations or are just passing through, it’s always a good idea to know the best local watering holes. So where are the best places to kick back, relax and have drinks with your friends? Here are the best bars in Missouri to hear a band, get a drink, play video games, and feel like one of the family. Lindberg’s Tavern is located on the newly-rebranded C-Street in Springfield—home of the most unique clubs, boutiques, shops and restaurants in the city. At almost 150 years old, Lindberg’s is the oldest tavern in Springfield. It once was the favorite watering hole of railroad workers, and now hosts live bands and other shows every weekend. Lindberg’s makes a point of sourcing its beer and food from local businesses, contributing to the growth of the local economy and providing a great experience for all its patrons. Located in Kansas City’s historic Power & Light District, KC’s Garage Kitchen and Bar is a good, old-fashioned dive in a neighborhood filled with upscale wine bars and clubs. It’s actually a new establishment but feels like it’s always been tucked back into that brick wall waiting to be discovered. KC’s Garage is already known for three things—cheap drinks, amazing food, and legendary karaoke. Columbia is known as a music town, and in a community where the biggest business is a major university, that means bars. But even among the great music clubs in Columbia, Nash Vegas stands out. It features rising stars on the pop, country, and indie circuits, plus cheap beer and dancing. What more could anyone ask of a night out? From the outside, the Lake House looks like exactly that—a lake house set on beautiful Table Rock Lake in Branson, complete with intimate back deck and dock on the water. With live music every Friday and Saturday, the intimate lakeside setting feels like sharing a drink or a meal in your own backyard with your best friends. The Rude Dog Pub in Cape Girardeau is built around the unique personalities of its proprietors, Mark Weber and Todd Henneman. These guys are on site almost every time the doors are open, introducing bands, meeting patrons, and making sure everyone is having a good time. The Rude Dog Pub is one of the best places in Cape to enjoy live music and have an adult night out. The Silver Ballroom is home to two great things: Pinball and punk rock. Open since 2010, this bar is home to some seriously great drink specials, great music, and of course, pinball machine! Jam out to your favorite tunes, while sipping on your favorite drink, and playing a game on one of their 1980s-era pinball machines. The Silver Ballroom will surely give you a night to remember. Bumps Barefoot Bar and Grill is located in the Gravois Arm Marina complex at Lake of the Ozarks. There are plenty of lakeside bars and restaurants at Lake of the Ozarks, but Bumps is known for its live music every weekend, which patrons can enjoy sitting out on the deck and looking over the water, or they can just pull their boats up to the dock and enjoy the hot food, cold drinks, and live music right from their boats. Red Fish, Blue Fish has been called St. Charles’ best kept secret. Like all the best bars, it does offer live music, about every other weekend, but the big draw are its nightly specials. Every night of the week has some feature to draw people in, including Ladies’ Night, Industrial Night, Mug Night, and $12 Bucket Night. St. Louis was named Best Bar Town in America in 2015, and John D. McGurk’s is one of the best of the best. The interior of McGurk’s would be enough to put it high on the list, with five separate wood-and-brick rooms, three separate bars, and a stage that holds some of the best shows in the region. But it’s the outdoor space that makes McGurk’s shine, with extensive patios, landscaped gardens, fountains, and many comfortable outdoor table. There’s no better place in the state to enjoy food, drink, music, and a beautiful night. 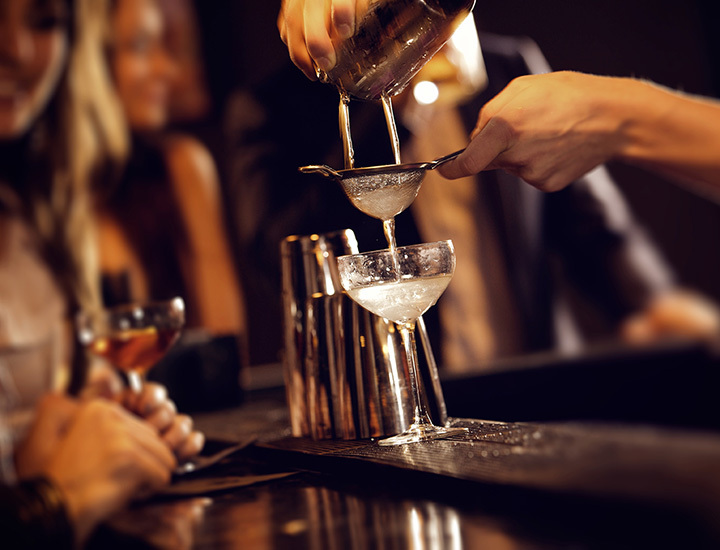 Is the bar scene not really your thing? Would you rather stay home, play some video games, and get into the “Star Wars” vs. “Star Trek” debate with friends...again? You’re not alone! In fact, there are so many of you that you now have your own “bar scene,” where you can drink, meet people, play Nintendo 64, and watch “Star Trek” and “Star Wars” to your heart’s content. The owners bill Club Geek as a place where you can be yourself! View more Missouri Bars and Saloons.